Thanksgiving is the most gut-busting day of the year. Many people overdo it, but on "The Early Show", registered dietician Keri Glassman, a contributing editor for Women's Health magazine, showed how you can make the right choices, with advice on what to skip, and what to savor at your Thanksgiving meal. The first item Glassman addressed is wine. Should you have white or red? White wine, Glassman said, is the right choice. A four-ounce glass of chardonnay, she said, is 90 calories versus twice as much in a port wine (185 calories). She added you can knock off another 45 calories if you make your white wine into a spritzer in a champagne glass. "This way, you still get the taste," she said. "Note that while there are less antioxidants in white wine versus red wine, if you're watching your weight you are better off going with less calories by choosing white. It will benefit your heart, and overall health more in the long run." 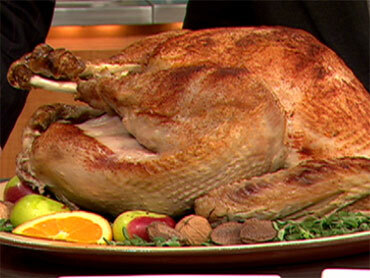 But what about the main event -- the turkey -- should you eat white or dark meat? The leanest poultry is white meat from the breast with no skin, Glassman said. As for the portion, it should be the size of an iPhone, or slightly bigger than a deck of cards. This serving size of dark meat, Glassman said, is 286 calories versus white meat at 124 calories. And if you remove the skin, Glassman added you can skim off an extra 35 additional calories and three grams of fat. Also, if you choose a low-fat cooking method, such as grilling, broiling, roasting, sautéing and baking, that allows for even more fat to drip away, Glassman said. As for the trimmings, Glassman said one to two tablespoons of gravy is OK at only 6-18 calories. The tip Glassman suggested is to use an actual tablespoon instead of using the spout of the gravy boat because you'll use less. "People don't realize how quickly calories can add up if you pour this all over your plate," she said. "Gravy is mostly composed of fat and salt so you should try to steer clear if you can." However, if you absolutely can't go without, when preparing the gravy, reduce the amount of fat by refrigerating the turkey drippings and skimming off the hardened fat. As far as stuffing goes, Glassman said it's best to go the homemade route, but instead of white bread use whole wheat, or high fiber grains like wild rice and cook outside the bird where it won't absorb fat-laden drippings. Also, instead of butter use some olive oil and chicken broth. This will save you up to 400 calories. Sweet potatoes, Glassman said, are the way to go -- even with the marshmallows. And the bonus, she said, is if you scrape off the marshmallows this Thanksgiving, you will eliminate three grams of sugar and 30 more calories. Instead, you can add cinnamon sticks, and nutmeg, which are plentiful in antioxidants and delicious flavor. "You should savor the sweet potatoes and skip the regular mashed potatoes because of the cream and butter this has in it," she said. "You can mash sweet potatoes without worrying about adding the cream or butter because of its natural texture and sweetness sweet potatoes have. Sweet potatoes are also packed with Vitamin C and A, and fiber." As for the sweet sides, such as applesauce and cranberry sauce, Glassman said applesauce is the dish to savor at half the calories (83.5) and one-third the sugar of jarred cranberry sauce, which has 209 calories. However, cranberries are high in Vitamin C and have antioxidants, Glassman said, so you can make it yourself and save on calories. "The key to these sauces is to reduce the amount by using fresh products and not adding additional sugars," Glassman said. "Fresh cranberry relish is easy to make and will save about 100 calories and half the sugar, compared to the jarred version." To make cranberry relish, just add two cups of fresh cranberries, one granny smith apple, one navel orange, unpeeled and chopped, and a little bit of honey. Glassman said, this way you even get some of the nutrients from the apple in the same dish without overloading on the sugars. In the dessert category, Glassman said you should savor that slice of pumpkin pie over a dish like carrot cake. "Pumpkins are packed with beta-carotenes, an antioxidant, and (are) a boost to your immune system during the cold Thanksgiving weather," Glassman said. An additional benefit is that pumpkin is also a great source of fiber. "So if you aren't already full before Thanksgiving dessert, this healthy treat will definitely do the trick," she said. Pumpkin pie, she said, is almost half the calories as carrot cake with relatively same sugar -- but half the fat. Pumpkin pie has 316 calories, Glassman said, while carrot cake has almost double at 563 calories. The typical Thanksgiving fare could add up anywhere from 2,500 to 3,000 calories, Glassman said, but a person should consume only 1,200 to 2,000 calories at a meal. "If you stick to making the smarter choices, you could save yourself approximately 1,000 calories," Glassman said.